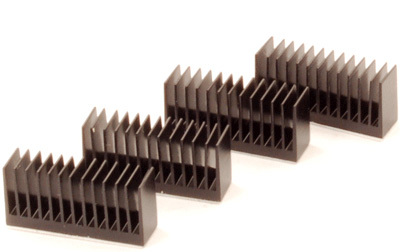 The MC21 is a small aluminum heatsink designed to cool surface mount components such as mosfets. The product was tailored to fit the VCore mosfets on nVidia's G80 series graphics cards, but it can also be installed on motherboards mosfets, and any other IC application where passive cooling is desired. It is a perfect companion to our VGA water-blocks and allows high-end graphic cards to operate cool and in virtual silence.